Getting the perfect, portfolio-worthy shot of Petra by Night takes strategy, timing, technique, and a bit of luck. Here are a few tips that will help you walk away with a photograph you can be proud of. Depending on the amount of visitors on any given night, arriving early may or may not benefit you. Crowds start to gather at the Petra Visitor Center around 8:00 PM (and possibly earlier), so being at the front of the pack ensures you will get down to the Treasury before the majority of the crowd. When the gates are opened, hurry down to the Treasury as fast as you can. While I would generally recommend walking slowly through the Siq canyon during the day, there’s not much to see at night so there’s no benefit to walking slow. The goal here is to get a jump on the crowds. Arriving at the Treasury early may allow you to get a front row seat on the mats. Being in front allows you to set up your camera and take pictures throughout the show without any obstacles in the way. If you can manage to get a seat on one of the front rows mats then you can photograph throughout the show. If front row seats aren’t available, it’s advisable to stand to the right side (when facing the Treasury) or near the back. Try to find a position that offers unobstructed views. You’ll only have a couple minutes to take some photographs before the area in front of the Treasury fills up with visitors. This is where pre-planning comes into play. Avoid wasting time by having your camera settings set up before you arrive. Even if you’re not quite sure what your final camera settings may be, having an approximation dialed in will give you a good base to start. During the show, many of the visitors will be using point-and-shoot cameras or phones to take pictures of the Treasury. Most of their cameras will be firing off flashes due to the dim lighting. Attempting to photograph the Treasury through the barrage of flashes is pretty much an exercise of frustration, so sit back and enjoy the show. This is the disaster that happens when everyone uses their flash. Don’t be that person! Some people leave immediately once the show is over. Others stick around to try to get photographs. If you want a shot without people loitering around, try to stay until the last minute. My favorite shot of the evening was the last shot that I took, and I was the last person “out the door,” so to speak. 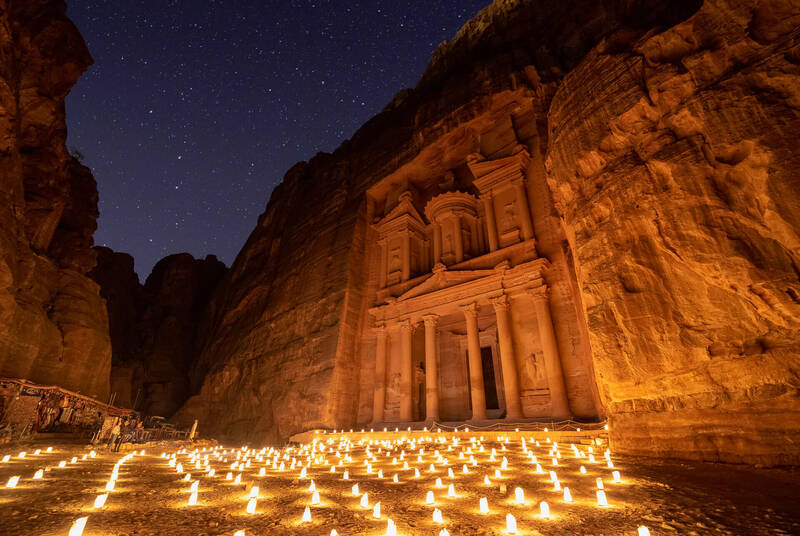 If you’re planning to use a phone to capture images of Petra at Night, there are a few options that may produce better results. First of all, turn off your flash. The tiny flash on your phone isn’t nearly powerful enough to light up the massive Treasury, especially from a distance. Second, stabilize your phone. The shutter of your camera is going to want to stay open longer in order to capture as much light as possible, so any movement may end up in a blurry photo. Stabilizing your phone on a small tripod or on another solid object is best. And third, use a professional camera app that allows you to control your camera shutter. When your shutter is “slow,” it means that it is open for longer. The longer the shutter is open, the more light is collected. Apps like Camera+ or Slow Shutter allow you to capture more light over a longer period of time, which guarantees your photos won’t be too dark. 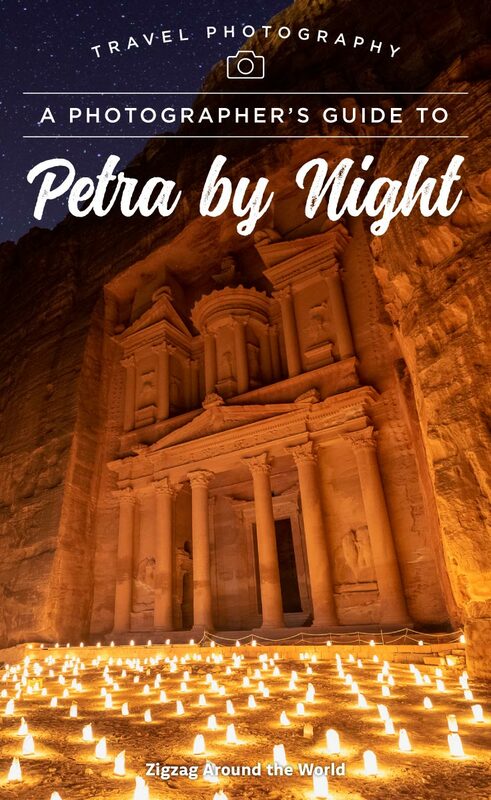 Point-and-shoot cameras are capable of capturing decent shots of the Petra by Night as long as you use the right formula. In fact, with the right technique, you might be surprised at the result. Like with the other camera types mentioned here, turn off your flash; it won’t do you any good. Set your camera to Night Scene mode, if available. Night Scene mode is built to take landscape or city shots when there isn’t a lot of natural light. Depending on your camera, Night Scene mode may slow down your shutter to capture more light, adjust the light sensitivity (ISO) of the camera for dim settings, and adjust the white balance to counteract Tungsten (orange) light. No matter your type of camera, having a stabilized shot is key. A travel tripod or other form of stabilization will work wonders here. Take a few test shots to determine whether you are satisfied or not. Don’t be afraid to switch your camera back into Auto mode if you feel like that produces a more pleasing image. DSLR or pro Mirrorless cameras are best for photographing Petra by Night. But the best camera in the hands of a novice is still capable of producing unsatisfactory photographs, especially at night. Use the following techniques to get the shot you really want. Use a tripod. I can’t stress this enough. You absolutely will not get a good hand held shot. You’ll be using a long/slow shutter in order to allow your camera sensor to capture more light, so having a tripod for stability is crucial. Use a remote, shutter release, or self-timer. When taking long-exposure shots, even the slightest movement to the camera will result in blurry photos. A remote or wired shutter release will allow you to trigger the shutter without physically touching the camera. If you don’t have a remote or shutter release, set your camera’s self-timer to trigger the shutter several seconds after you press the button. This will allow your camera enough time to stabilize before taking the shot. Shoot in Manual mode. While your camera might perform admirably in Auto mode, you’ll get the best shots by taking full control over your camera’s settings. Manual mode can typically be set by adjusting the mode dial on your camera to “M.” Once in Manual mode, you’ll need to make changes to the following 4 settings: ISO, Aperture, Shutter Speed, and focus. Keep reading for more information on each of these settings. Adjust your ISO. ISO determines your camera’s light sensitivity. The higher the ISO number, the more sensitive your camera is to light. You’d think that cranking up the ISO would produce a brighter image, and that’s true but not recommended. Higher ISO amounts produce greater camera noise – grainy pixelation on the photo. Every camera is different when it comes to the maximum ISO it can handle before images become too “noisy.” You’ll want to experiment a bit on a dark night in order to determine your camera’s ISO threshold. Start with an ISO setting of 800 and keep increasing the amount until you find the right balance between brightness and clarity. You might need to preview your images in 100% magnification on the back of your camera to see the difference. Set your Aperture. The Aperture (also known as f-stop) of your camera lens functions similar to the iris of your eye. When closed down tight, less light enters the lens and hits the camera sensor. When opened wide, the camera sensor is able to capture more light in a shorter amount of time. Each camera lens has different aperture width capabilities, so you’ll need to check to see how wide your lens can go. 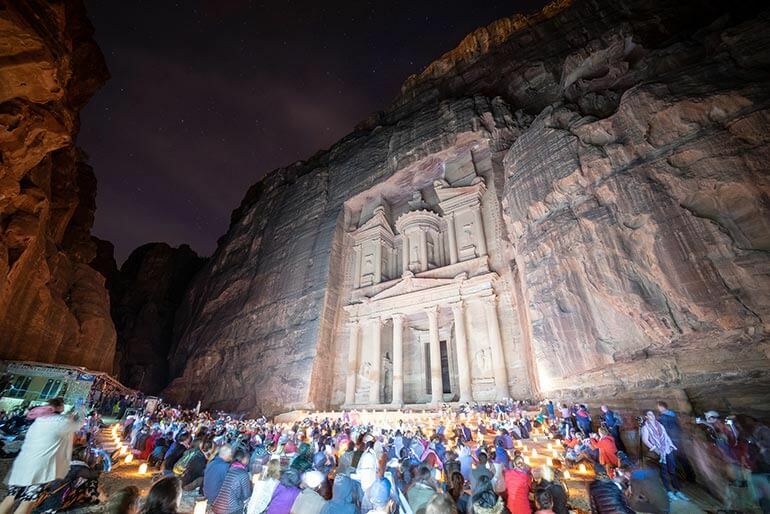 For photographing Petra by Night, wider is usually better. Wider apertures are designated by lower numbers, so an aperture of 2.8 would be wider than an aperture of 3.5 or 4. Determine your Shutter Speed (or Exposure). The shutter of the camera functions similar to an eyelid. Opening the shutter for a shorter period of time allows the sensor to collect a small amount of light, and longer periods of time allow the sensor to collect greater amounts of light. In a dim environment like Petra by Night, you’ll want a longer shutter speed to capture a lot of light. How long you will need depends entirely on a combination of your ISO sensitivity and Aperture setting. Some cameras can get away with a 10-15 second shutter speed, while other cameras may need 30 seconds or longer. Be aware that when your shutter is open for long periods, any movement in the scene will result in a blurry area. Any flashes from other cameras will also produce problems in your image. Nail your focus. Autofocus doesn’t work well in low light, which is why it so important to manually focus your lens. Some lenses have a switch on the lens which toggles between autofocus and manual focus. On other cameras, you have to toggle between the two in camera. If your camera has a focus assist feature, use it to make sure the detailed areas of the Treasury are sharp. If your camera doesn’t have focus assist, use the live view on your camera to set your focus using the focus ring on your lens. Snap a shot and then view the preview at 100% to make sure your focus is set correctly. If you’re still blurry, make minor corrections with your focus ring and fire off another test until your focus is tack sharp. Turn off image stabilization. Some lenses (and some camera bodies) have built in image stabilization. Image stabilization is very useful when holding the camera by hand, but can cause problems when your camera is mounted on a tripod. Each camera manufacturer has a different term for image stabilization (OS, VR, SR, IS, Optical SteadyShot, and more), so find out how to turn it off on your particular brand of camera. Shoot in RAW. Photos shot in RAW (uncompressed) format contain more usable data, color information, and dynamic light range than compressed formats like JPG. Shooting in RAW allows you much greater editing freedom, but you’ll need editing software to make it happen. Software like Adobe Photoshop, Adobe Lightroom, or Skylum Luminar will do the trick. Take the shot. Once you’ve got your settings perfected and your location locked down, start shooting. It’s better to have too many shots than not enough. Be sure to check your shots from time to time to make sure everything is still on target.